1. Preheat oven to 220°C.To make the roasted raspberry jam, place the raspberries, sugar, vanilla bean and seeds in a small roasting tray and mix to combine. Cook, stirring occasionally, for 25–30 minutes or until thickened. Set aside to cool completely. 2. Remove and discard the vanilla bean. Reduce oven temperature to 150°C.Place the eggwhite in the bowl of an electric mixer and whisk on high speed until stiff peaks form. Gradually add the sugar, 1 tablespoon at a time, waiting 30 seconds before adding another tablespoon. 3. Once all the sugar has been incorporated, scrape down the sides of the bowl and whisk for a further 6 minutes or until the mixture is stiff and glossy. Add the vinegar and whisk for a further 2 minutes or until glossy and combined. 4. Place spoonful’s of the meringue onto a baking tray lined with non-stick baking paper to make a 22cm round. Reduce temperature to 120°Cand cook for 1 hour. Turn the oven off and allow the pavlova to cool completely in the oven. 5. Place the cream in the bowl of an electric mixer and whisk to stiff peaks. 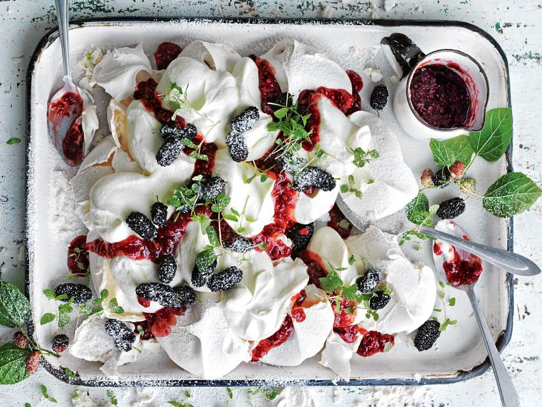 Place the pavlova on a large serving plate and crush slightly with the back of a large spoon. Spoon over the cream and drizzle with the roasted raspberry jam. Top with the mulberries and mint, and dust with icing sugar to serve. Serves 8–10.